FlipBook® and FlipBook Lite are the #1 animation apps for your iPhone, with well over 2 million downloads! Easily make your doodles come to life and share them with your friends. FlipBook has everything you need to get started animating, from an eraser to onion skinning (which lets you see a faint image of the previous and next frames) to layered drawing. Load images from your photo library, including images taken with your iPhone's camera, and draw on top of them. If you make a mistake, just touch Undo. Touch Play when you're ready to see how your movie looks. Share your movie by uploading it to flipbook.tv so that everyone can see it. FlipBook puts animation into your hands. Macworld gave FlipBook 5 mice and said that "FlipBook gives users a canvas for creating something special." TUAW.com called FlipBook "incredibly easy to use" and concluded that it's "a well-designed program with excellent interaction details." 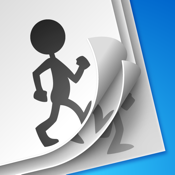 FlipBook Lite is a free version of FlipBook. It's fully functional but limited to 5 movies, with at most 50 frames and 3 layers each, as well as 1 movie hosted on flipbook.tv. Purchase the full version of FlipBook to remove those limits. FlipBook is a registered trademark of Anon Arts LLC, and FlipBook and FlipBook HD are fully owned by Anon Arts LLC.